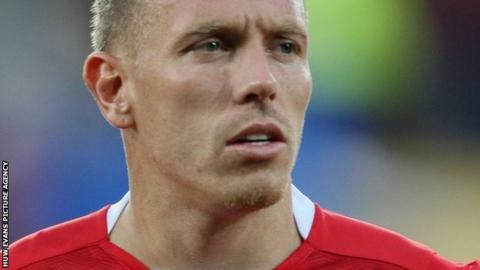 Wales are hopeful Craig Bellamy will commit to another qualifying campaign for his country. The Liverpool forward, 32, has said he is considering international retirement after the Gary Speed Memorial Match against Costa Rica on 29 February. But Wales assistant Osian Roberts says Bellamy has had positive discussions with new Wales manager Chris Coleman. "I've had no indications that he will be [retiring after the Costa Rica game]," Roberts said. "He's had good discussions with Chris as well so hopefully that's a positive thing. "Obviously we have to manage his injuries and his physical state, and we have to be careful with that. "But the form he's been in with Liverpool has been absolutely fantastic this year and for us it's imperative he's in the team and around the squad, because not only is he influential on the pitch, he's extremely influential off the pitch and in the dressing room." Bellamy has scored 19 goals in 67 games for Wales since his debut in 1998 against Jamaica and has impressed for Liverpool this season after leaving their Premier League rivals Manchester City for a second spell at Anfield. Much of Bellamy's career has been blighted by serious knee injuries and the Cardiff-born player has had to carefully manage his fitness and playing demands. But Roberts says that the veteran's influence on his Wales team-mates is second to none and would be a very hard personality to replace. "They all look up to him, he's the ultimate professional. He trains like he plays, with great intensity, and that's why you have to manage the workload with him," Roberts said. "He sets the standards and makes sure that players around him also are raising the bar and he's a great example to any young player out there. "And as a result that rubs off on the others, be that on the training pitch, on the pitch itself, or in the dressing room." While the Wales backroom staff hope that Bellamy continues playing, they are certain that his successor as captain - 21-year-old Arsenal midfielder Aaron Ramsey - is perfect for the role. "I can't see any reason for that [to change], he's grown into the role particularly well," Roberts said. "When we sat down and looked at the candidates we thought he's going to be captain of Wales some day, so we might as well start now and let him grow into it a little bit earlier. "The proof is in the pudding really, in how he's grown into it, matured into it, and if he can be the leader of Wales for years to come then we're going to be in extremely good hands."